Daft Punk inspired Monster Tron: Legacy headphones | What Hi-Fi? So what's the connection? Well it seems Disney Consumer Products (DCP) joined up with Monster Cable to develop a Daft Punk-inspired range of Tron: Legacy electronics. Musical duo Daft Punk composed the soundtrack for Walt Disney Picture's Tron: Legacy, opening nationwide in the US and UK in 3D on December 17th. Monster engineers worked closely with DCP to create the new Daft Punk Edition Tron: Legacy over-ear headphones (try getting that into a headline). Inspired by the robotic costumed duo, the headphones "immerse users in the world of Tron: Legacy with a special surround-sound mix of the Daft Punk-engineered soundtrack that comes with the headphones". 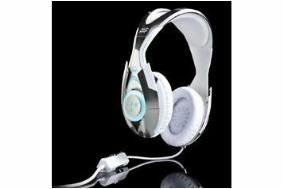 Daft Punk Edition Tron: Legacy headphones by Monster cost £249.95 and will be available in the UK from Comet, HMV, leading department stores and specialist retailers. We suspect our First Tests editor will be just dying to get his hands on a pair of these.